I hope I got a good one or two here? I found a couple people out there who had good things to say about them so I hope I like it! I was looking for a Jones paddle but seemed like they are rare and hard to find. any input would be appreciated. I purchased one of these today and actually bid on the only two on Ebay and as luck might have it whether good or bad I'm the proud owner of two now! I didn't see that coming lol what to do with two of them?? I will pick out the best one and resell the other to recoup my cash I guess. That paddle will outlive you.
. . . Good purchase! I will pick out the best one and resell the other to recoup my cash I guess. Sounds like a plan to me…. Very cool paddle! Thanks for sharing. I picked one up on Epay for $15. It was one of those things that was mislabeled by the seller who did not have a clue what she had and nobody bid on it. the woman had listed it as morse code and other. I noticed it because of the picture she had posted together with the item. In mint condition and came together with a keyer which I guess was the other. Sold the keyer on QTH for $35 and kept the paddle. I have 15 other paddles. The Brown Brothers is nice and I will keep it because is a piece of ham radio history. I have a few others that I prefer over this one. 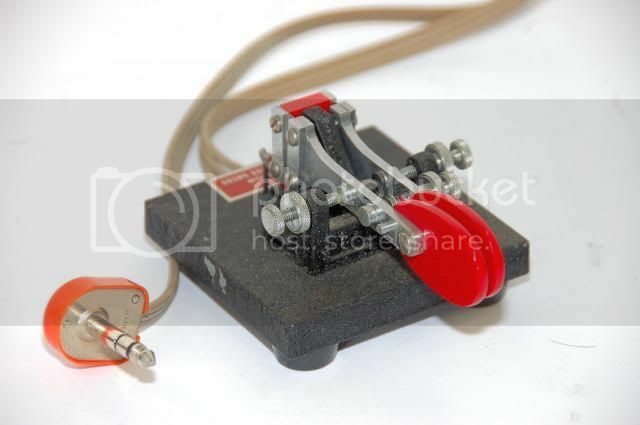 My favorite is a N3ZN non iambic single paddle. My second favorite is an iambic paddle also by N3ZN and then a Kent dual paddle. They sell for around $125. I used a BTL-A for a few years before getting the ZN-9B from N3ZN. The BTL-A is very good, but I prefer the much heavier ZN-9B. If you can keep the BTL-A from scooting across your tabletop, you will be a happy camper. I've used one of these for many years. To keep my from scooting across the desk, I replaced the rubber feet with suction cups and it doesn't move. I bought an old Palomar electronic keyer with a BTL mounted inside it. Just the key mechanism, no heavy mount. It has bare nuts and bolts to adjust the action, not the nice knurled hardware. Scott Robbins W4PA at Vibroplex shipped a blank paddle mount with feet. The guys in the shop at work drilled and tapped the blank mount to accept the BTL. So now I have a BTL with hardware that looks like Frankenstein's neck.